What the heck is GRS-IBS you ask? GRS-IBS stands for Geosynthetic Reinforced Soil-Integrated Bridge System. GRS-IBS is a new way to build bridges that saves time and money. You want two bridges for the price of one? GRS-IBS bridges contain the typical components of a conventional bridge: the abutment (substructure), bridge beams (super structure), and approach. The difference between GRS-IBS and conventional bridges occurs at the abutments and approaches. Conventional bridges supported on shallow foundations typically include cast-in-place, reinforced concrete abutments and approach slabs. Conversely, GRS-IBS bridges utilize a geo-composite material derived from compacted gravel with layers of closely spaced geosynthetic fabric as abutments. The approaches of a GRS-IBS are constructed of a similar geo-composite material therefore eliminating reinforced concrete approach slabs. With GRS-IBS, the characteristic “bump” at the end of the bridge common to conventional bridges is proven to be eliminated. For span lengths less than about 80 feet, no cast-in-place concrete is required for GRS-IBS bridge substructures! Voided pre-cast slab girders are used for the superstructure and the girders sit directly on the geosynthetic-reinforced gravel mass. For greater spans, steel beams can be utilized for the superstructure. Steel beams typically bear on a cast-in-place or pre-cast concrete footing set directly on the geosynthetic-reinforced gravel mass. When can GRS-IBS technology be used? GRS-IBS technology can be utilized for bridges with a span length of 140 feet or less. According to the National Bridge Inventory Database, of the 369 Structurally Deficient Bridges in Washington, Oregon, and Idaho, over 90 percent have spans less than 140 feet. The use of GRS-IBS technology is not suitable for all bridges with spans less than 140 feet. Specifically, the use of GRS-IBS should not be considered for water crossings with high scour estimates and sites with highly compressible soils. However, GRS-IBS has been successfully used at sites with compressible soils where ground improvement was utilized. Additionally, GRS-IBS should be limited to abutments with a height of 30 feet or less. As part of the 2002 Bridge of the Future Initiative, FHWA introduced GRS-IBS to help meet demand for single-span bridges. FHWA further promoted the use of GRS-IBS through their Every Day Counts initiative in 2010. Since then, over 200 GRS-IBS bridges have been constructed in the US. 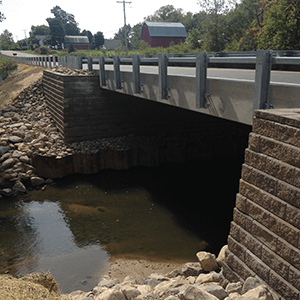 Of GRS-IBS bridges built in the US, Defiance County, Ohio has 30 currently in service. We caught up with Defiance County Operations Deputy Jeff Timbrook at a resent GRS-IBS workshop in Twin Falls, Idaho. Jeff has been in responsible charge of the construction of many of Defiance County’s GRS-IBS bridges. Jeff tells us that Defiance County self-performs many of the GRS-IBS bridges and that they’re building GRS-IBS bridges for half the cost and half the time compared to conventional bridges. Interested in using a GRS-IBS for your bridge project? Contact Rob Ross at Zipper Geo Associates, LLC. Rob has been designing geosynthetic-reinforced soil structures for almost 20 years now. For more information about GRS-IBS bridges, refer to the links below.